Calling all nature lovers! 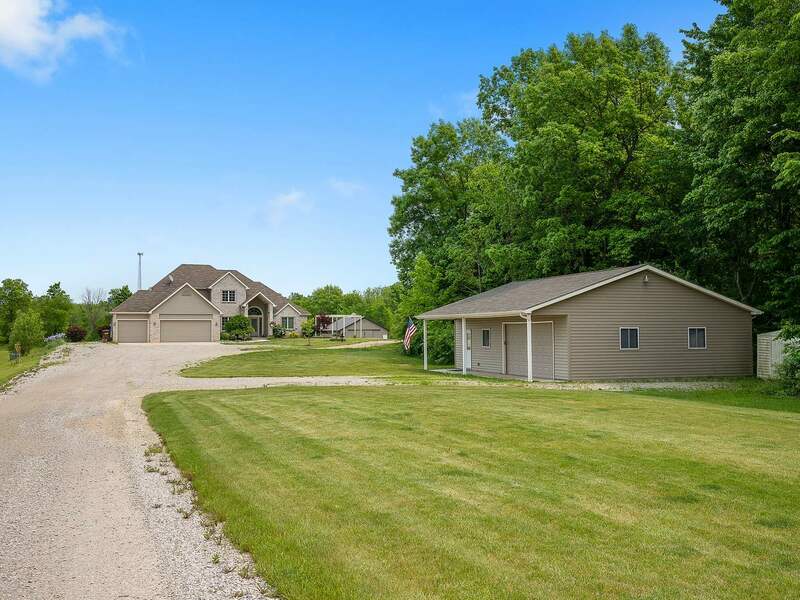 This 6.44 acre Unique Horse property is just a hop and a skip NE of Fort Wayne, close to HWY 8, 101, and 1. Conveniently located near Auburn, lakes, and schoolsâthis peaceful oasis is in Saint Joe, Indiana. Relax on the multi level deck as you watch for deer or ducks paddling in the shared pond. The new (2017) 36x48 horse barn with 4 12x20 draft horse-size Priefert custom stalls with feeders, translucent panels for more natural light, 2 12x10 sliding doors to allow vehicles through, and freeze-less water faucet for easy water access. There are also 2-12x24 run ins, high tensile-5 strand fence, and plenty of extra pasture. You can even raise chickens in the chicken coop and enjoy fresh eggs every morning with fresh vegetables from your very own garden patch with 2 rose gardens. Inside you'll find no wasted space in this optimized open layout with many great entertaining spaces. Gather around not one but 2 fireplaces in the winter, or host a BBQ in the summer at the wet bar in the finished basement that walks out onto the patio and above ground pool with recently refinished deck. Outdoor gazebo includes a fire pit. Updates to the kitchen include fresh paint, new granite countertops and backsplash, new sinks and faucets, newer refrigerator, and stainless steel appliances. You'll also find new sinks, faucets, granite, and fresh paint in the master bath along with an oversized jet tub and new shower. There's room for all your toys in the ample 40x36 detached shop with heating/aircon, recently installed 220v, and bay for automobiles, and the 3 car attached garage. Plenty of storage can be found in the attic, and all three of the bedrooms feature spacious walk in closets. This home has been well maintained and all the details attended to including hook up for surround sound and internet. Are you looking for a place to settle in and make your own? Schedule a showing today!